Andrew Stenson sings Tonio at the Sunday and Friday performances of Daughter of the Regiment. (Photo, left, by Elise Bakketun.) 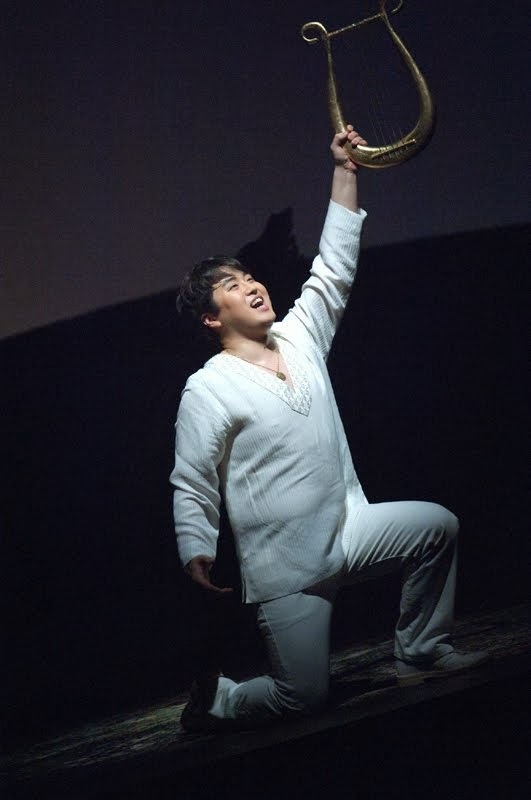 The Korean-born, Minnesota-raised tenor made his Seattle Opera mainstage debut as Arturo in 2010’s Lucia di Lammermoor, when he was in his first year as a Seattle Opera Young Artist. He went on to perform Don Ottavio, Werther, Ernesto, and Orphée in Seattle, and has a burgeoning career in New York and Europe as well. I checked in with him the other day about what he’s been doing since graduating from our Young Artists Program. Andrew Stenson singing "Ah, mes amis"
Last time we heard you, you sang Orphée, covering an indisposed William Burden. Did that adventure change anything in your career? That was such a rush! This company is fantastic—I had been so well-prepared by Seattle Opera, I felt so supported by everybody, production, artistic, top to bottom, that it really was a once-in-a-lifetime experience, and I’m really thankful for it. I got a wonderful review from the performance and I think that performance contributed to my being in Daughter of the Regiment. Even in those days, it seems to me, you used to sing “Ah, mes amis,” this crazy aria from Daughter of the Regiment where you sing 9 high Cs in a row. Because you have this bizarre facility, with your voice, to live up in the clouds! I think all young tenors practice “Ah, mes amis” secretly in their practice, you know, late at night when nobody is in the building, hoping to one day unveil nine magnificent high Cs at some point in the future. 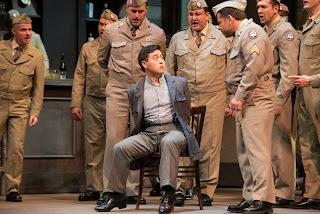 The first time I sang “Ah, mes amis” in public was at the Richard Tucker Auditions. Fortunately, it was also the best audition of my life! And the thing with Orphée, too, is that that role is outrageously high. Which is higher, Tonio or Orphée? Orphée is a much bigger sing. That big scene with the Furies, that’s almost all entirely above the staff. There’s a high D in there. When Berlioz transcribed that opera for mezzo, in the mid-19th century, he didn’t bother transposing parts of it—the last trio is in the same key! You once described the high tessitura of Orphée as “my wheelhouse.” How do you get up there? Or is it comfortable for you, living up in the clouds like that? Singing high is just something I’ve always been able to do pretty easily. 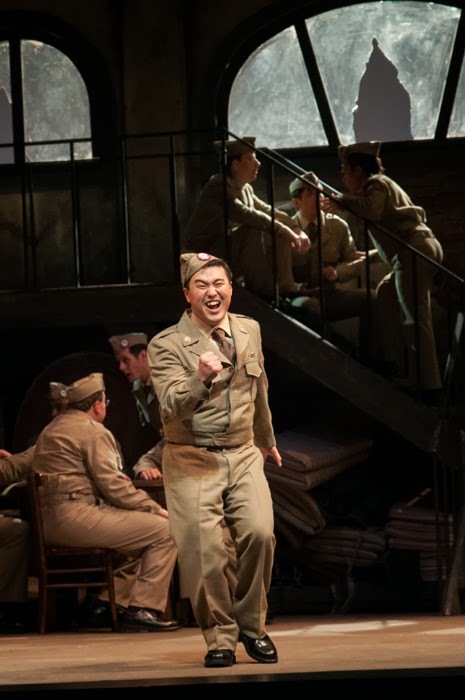 I was talking with Larry [Brownlee, our other Tonio] about singing the other day and I asked him about his coloratura [singing complicated florid passages with dozens of brief, connected notes]. He said it was something that he was always able to do, that it was pretty natural for him to begin with. That was my situation with the high range—once I got the right technical help, it opened up the top and I’ve always found that part of my voice dependable. It’s challenging, but it’s a fun aria, because you get to play. Have you ever done it without much success? I had a terrible, terrible audition once, where I was not feeling well but I went ahead and auditioned anyway, and for the last four of them I could barely vibrate...it was really, really bad! [laughs] That’s the other end of it. But when you “nail” it...yes, you can tell, by the energy of the audience, how you’re doing, and if you do well they go crazy. It’s so much fun. Tell us about your experience in Glyndebourne this summer. I was in Europe for five months, which was incredibly informative. I also found it quite isolating, to be that far away from family and friends. It made me realize what I appreciate about being home. But Glyndebourne itself was an amazing experience. We did a new production of Ariadne auf Naxos, starring Kate Lindsey, who sings here, as our brilliant Composer. We got to rehearse for seven weeks, so we had lots of little details. I was Brighella, and with the comics we got a nice dance sequence to go with our first ensemble. It was really fun, and coordinating the dancing with the difficult ensemble took a LOT of work. Vladimir Jurowski was our conductor, he was always challenging us to improve, at all fourteen performances. That’s a lot of Ariadnes! Was it televised? Yes, simulcast around the UK and online. I’m in my second year of the Lindemann Young Artists Development Program at the Met. This spring I’m going to sing Demetrius in The Enchanted Island. It’s the show I made my Met debut in, as a Quartet Singer, so I’ve been promoted! I’m really looking forward to that. You told us once that tenors were usually the straight man in a comedy. Is that the case in this show? There are some really, really brilliant, funny people in Daughter of the Regiment. It’d be pointless for me to try to compete! 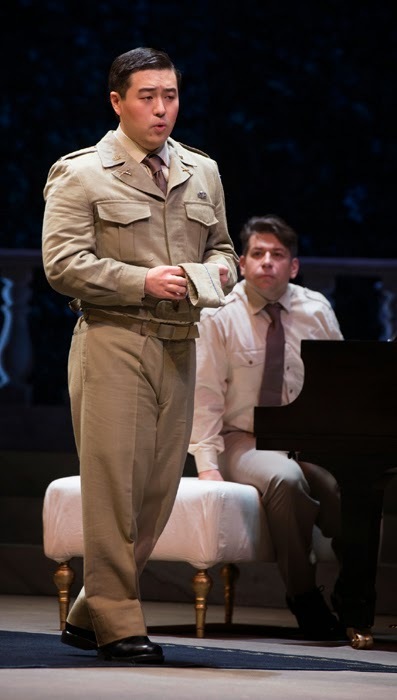 Larry and I get to have some fun, cute moments with Marie in the first duet; but Tonio has a lot more earnest music, serious scenes, and I like being able to provide that contrast to all these dozens of soldiers running up and down the stairs, that kind of thing. But you do do some stuff in Daughter that tickles your funny bone? Yes, Marie and Tonio have some playful banter, and when we enter for the duet we’ve stolen an officer’s bicycle, and crashed and hurt our legs, so there’s some slapstick there. Are you sharing the stage with your former Young Artists Program Artistic Director, Peter Kazaras, who plays the Duchess of Krackenthorp? Having learned so much from Peter, it’s such fun to see him in action and to be onstage with him. To see him at work—it’s great to see where that all comes from.